"You call THAT a Duck of Doom?! I'll show you DOOM!!" 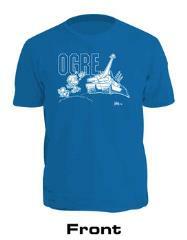 This playful T-Shirt by legendary Munchkin artist John Kovalic shows what happens when our product lines meet! But -- what will happen once the Munchkins find their spellcaster?! ?